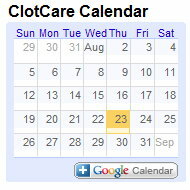 This overview was generously submitted to ClotCare by Phyllis Hayes. Ms. Hayes is a May-Thurner patient and was kind enough to share her own experience with us. This posting was reviewed and edited by ClotCare Senior Editor, Henry I. Bussey, Pharm.D., FCCP. One of the good things about operating the ClotCare Website is that the questions we get often teach me a lot. I had been heavily involved in anticoagulation management for more than 25 years and knew that DVTs tended to occur slightly more often in the left leg than the right, but I did not understand why that was. And I certainly had never heard of the May-Thurner Syndrome. That is, not until about 3 years ago when a patient submitted a question about this condition to ClotCare. That question prompted me to learn a little about May-Thurner Syndrome and, since then, May-Thurner patients seem to be everywhere. Hopefully the information that follows will help to increase awareness of this condition among both healthcare providers and individuals who may be affected by May-Thurner Syndrome. May-Thurner Syndrome was first identified by Doctors May and Thurner in 1957. May-Thurner Syndrome is an anatomic variant with which a person is born; it is not inherited. May-Thurner Syndrome most commonly takes place when the left iliac vein is compressed by the right iliac artery. This compression then narrows the left iliac vein leading to leg pain and swelling and increases the possibility of a deep vein thrombosis (DVT). Not everyone who has May-Thurner Syndrome will experience a DVT; in fact, some people will never have a problem with their venal compression because the severity of the compression varies greatly. Symptoms of May-Thurner Syndrome include swelling and numbness in the leg, symptoms similar to “restless leg syndrome,” pain in the thigh or hip, burning pain in the foot, lumbar back pain, issues similar to sciatic nerve pain, disproportionately swollen left thigh, or swelling of the veins and development of varicose veins in the pelvic area. May-Thurner Syndrome causes between 2% and 5% of venous disorders in the lower extremities. May-Thurner Syndrome is 3 times more likely to occur in women as men. Often women on birth control or women who are pregnant experience a DVT or other MTS symptoms. Diagnosis of May-Thurner Syndrome is made via IVUS (intravascular ultrasound with an ultrasound catheter inside the vein), pelvic CT, or MRI. A routine Doppler ultrasound cannot diagnose May-Thurner Syndrome since pelvic veins cannot be seen well by this method. Treatment of May-Thurner Syndrome includes anticoagulation medication, use of medication to dissolve clots by way of a catheter, and endovenous stenting. Endovenous stenting is the current "method of choice." This procedure can be performed by either an Interventional Radiologist or Vascular Surgeon. Various support groups for people with May-Thurner Syndrome are available online, some by invitation following diagnosis. Facebook also offers specific groups involving May-Thurner Syndrome.